Dr. Rose Jacklin is all about teaching her students to be proactive in their academic achievement. Whether she’s teaching world geography, civics, Utah history, or sociology, Dr. Jacklin takes an activities-based approach to learning. She instills a sense of commitment to country and community in her students. 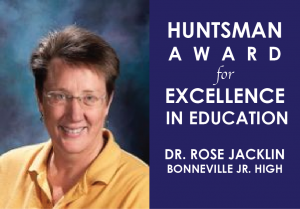 Dr. Jacklin is one of 11 outstanding educators in the state who were chosen by the Huntsman family to receive the annual Huntsman Award for Excellence in Education. Each winner will be recognized at a banquet on May 15 at Little America Hotel, where they will receive a $10,000 prize.